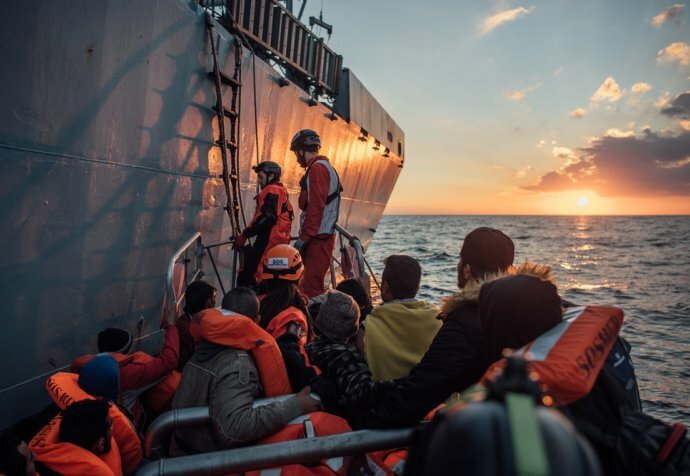 This World Refugee Week we talk to New Zealand logistician Shaun Cornelius about his time on board the MV Aquarius, a search and rescue ship operated by Médecins Sans Frontières and SOS Méditerranée in the Mediterranean. This is your second placement on board the Aquarius. Why do you think people are continuing to take this dangerous journey across the Mediterranean? Many of the people we talk to have been through experiences that are so extreme compared to what we encounter in New Zealand, it is hard to comprehend. They tell us they are fleeing violence, war, persecution and poverty in their home countries. Attempting the Mediterranean crossing is only one part of their journey. Most tell us they have spent months, sometimes years, trapped in Libya. Once they leave their home countries they are exposed to alarming levels of violence and exploitation, and are simply commodities to be moved on for profit. We repeatedly hear stories of shootings, beatings, detention, extortion, starvation and sexual abuse. What are their experiences once they start the journey to Libya? The crossing of the Sahara desert from Niger into Libya is particularly arduous, they are packed onto the back of overloaded pickups or trucks, with little water and food. It takes around three days of continuous travel under hot dusty conditions. Anyone who gets ill or can’t hold on anymore can be left in the desert. There is no medical care anywhere throughout the journey, and we often hear of overcrowded detention conditions with limited sanitation.
" We often hear about people who just want to go back to their home countries, but there is no way to go back, and the only way to escape Libya is to go on a smuggler boat"
The physical effects of their treatment are frequently obvious when they come on board, but less immediately apparent is the psychological impact of being detained for long periods while having no idea of where they are or what is going to happen to them, no communication or support from outside, while being subjected to random violence and abuse. We often hear about people who just want to go back to their home countries, but there is no way to go back, and the only way to escape Libya is to go on a smuggler boat. Many are terrified of going in the boats, and there are accounts of people being shot on the beach when they refuse to get into the boats. Spending six hours packed into a slowly sinking boat, alone in the dark on the ocean, expecting to drown within the hour is just the last step before we pick them up (or as is sometimes the case, they simply disappear, leaving a few floating bodies and some debris). Are there any stories that have had an impact on you? There are so many stories it is hard to pick out any particular one. We often have young women or sometimes couples travelling with babies and young children. Seeing them come on board is very moving. Raising and caring for children is difficult enough in our developed world context, it is hard to comprehend what it must be like for them and how they manage, and what it is like to take one’s children on such a dangerous journey. There is not a lot we can do on the ship in terms of practical help for their onward journey. We always try to identify the most vulnerable people and link/refer them to other actors in Italy such as UNHCR and IOM. However, I have realised just how much of an impact we can make simply by treating people with respect and empathy, as fellow human beings, and listening to their stories. For most these are some of the most important things that have been taken from them, and which will be lacking as they go forward. People remember small acts of kindness and respect for a very long time, and these can provide hope that somewhere there is a better future for them.